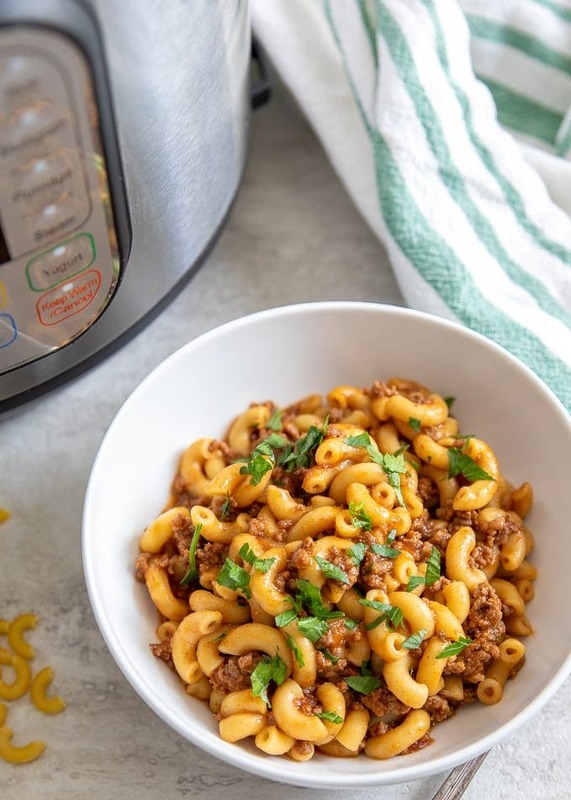 Instant Pot Hamburger Helper is sure to become a family favorite! This easy version of Hamburger Helper, or American Goulash, is ready in less than 30 minutes from start to finish and made entirely in the pressure cooker. Don’t have a pressure cooker? Make my stove-top Hamburger Helper instead! Looking for more Instant Pot Recipes? Check out all my Healthy Instant Pot Recipes. My husband LOVES Hamburger Helper. As a child he loved the boxed version, as an adult he greatly enjoys my homemade version, which is a staple at our house. 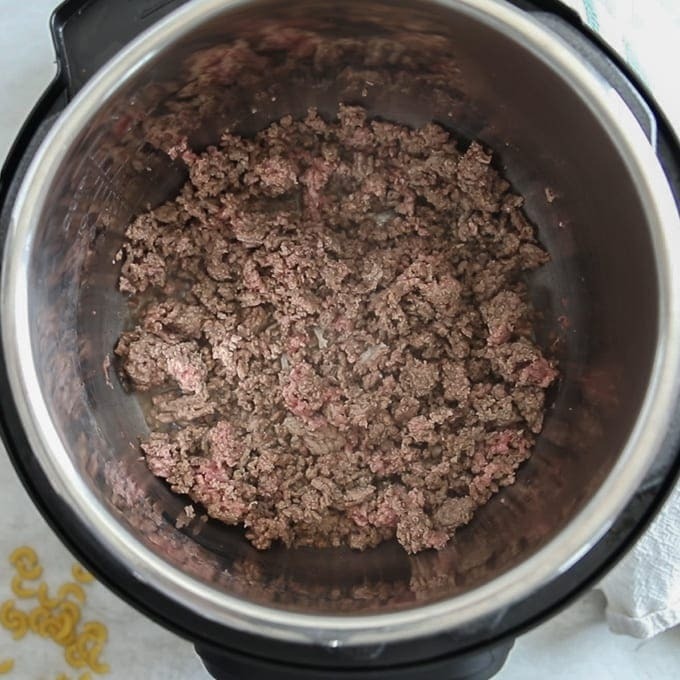 I have had many requests for an instant pot version of my stove top Hamburger Helper. And I am here to deliver with an easy, delicious recipe that your family will beg for again and again. 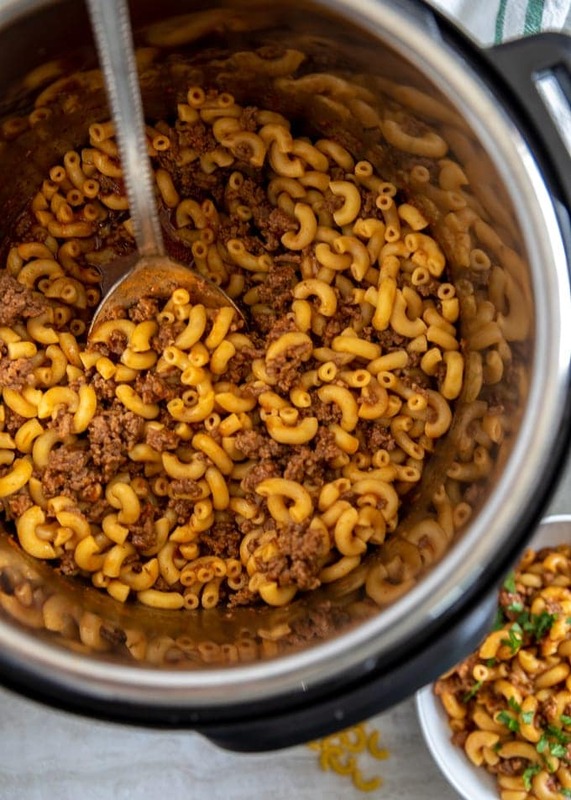 Instant Pot Hamburger Helper is made in one pot and comes together in LESS than 30 minutes. It is picky eater approved, economical to make, and incredibly tasty! This instant pot version is almost identical to my stove-top version. The bonus of using the instant pot is that once the meat has been browned, this meal is hands off and the noodles cook up perfectly! Turn Instant Pot to saute and allow to heat up. Once instant pot has heated (the Instant Pot will say Hot). Add in the ground meat and brown up, breaking up into small pieces as the meat cooks. Once meat is browned, turn off the pressure cooker. Drain off any fat if desired. Add in beef broth to Instant Pot and scrape up all the browned bits off the bottom of the Instant Pot. Add in garlic powder, onion powder, salt, paprika, and tomato sauce and stir to combine well. Add in noodles and gently push down into sauce–do NOT stir into sauce. Once cook time has elapsed, let pressure release naturally for 5 minutes. Then do a quick release of any remaining pressure–be sure stand away from vent knob when releasing pressure. Stir in Worcestershire sauce into the hamburger helper and serve. If your family is like mine, you will want to double this recipe! My kids BEGGED for leftovers in their school lunches. To double your recipe, simply double the ingredients. The cook time will remain the same! There are 3 things you can do to help avoid getting the burn notice when cooking in your Instant Pot. Start with a clean inner pot. Make sure the bottom of your inner pot is clean from residue from former recipes–I use steel wool to get that bottom perfectly clean in between uses. After browning the meat, add in beef stock and scrape up any browned bits on the bottom of the pan. Do not STIR in noodles, just gently nudge them down until covered with the liquid. Once instant pot has heated, add in the meat and brown up, breaking up into small pieces. Once meat is cooked, turn off the pressure cooker. And drain off any fat if desired. Add in noodles and gently push down into sauce. Cook on high pressure for 3 minutes (hit manual and adjust time by using +/_ buttons until timer reads 3). Once cook time has elapsed, let pressure release naturally for 5 minutes. Then do a quick release of any remaining pressure--be sure stand away from vent knob when releasing pressure. Feel free to use any ground meat your like for this recipe. Both whole wheat and regular elbow noodles work. I find Barilla brand of gluten free noodles works best if making this gluten free. This brought me right back to childhood! But it was so much better than the boxed stuff! I am so glad you were able to enjoy a childhood favorite. After making this quick and easy Instant Pot version, I’ll never buy the boxed stuff again! Thanks so much for sharing! YAY! So glad you enjoyed Jessica! How well would this work with Tinkyada Brown Rice noodles? Also, what kind of worcestershire sauce do you use? Thank you! 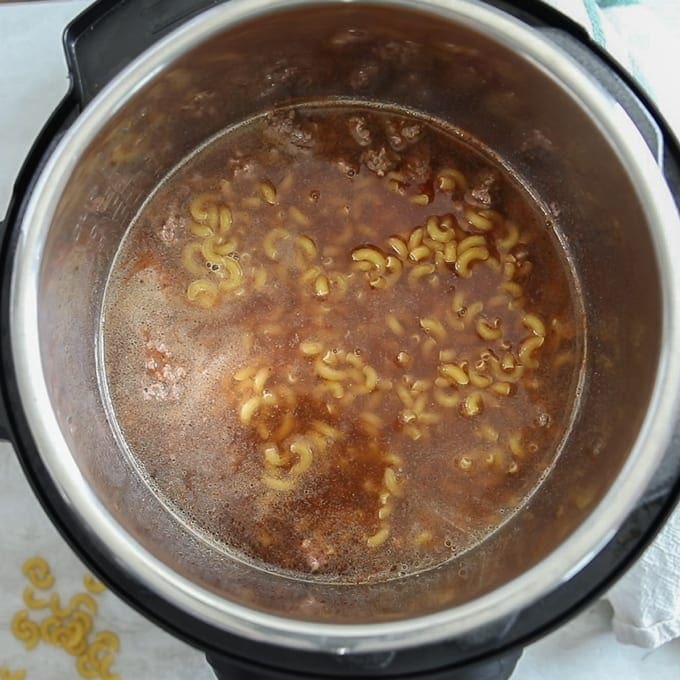 Hi Deborah, I have used Barilla GF pasta with success but have not tried this recipe with the Tinkyada brand–however, I would think it would work, as long as this brand does not create too much foam when cooking (which then would not be suitable for the Instant Pot). Sorry I don’t have a more definitive answer. As for Worcestershire sauce, I use French’s but any brand will work.